Bel Canto Designs Jewelry Giveaway! If you’re a lover of vintage wedding style, then today’s giveaway is for you! The fabulous Mari of Bel Canto Designs (one of our Real Wedding sponsors, and an artist whose work we adore) is giving away a pair of these vintage-inspired rhinestone and pearl chandelier earrings to one lucky Junebug reader! (See the stunners in the photo above.) To enter to win, simply head over to the brand new Bel Canto Designs online shop, browse through the collections of necklaces, hair combs, head bands, bracelets, and earrings that have been lovingly created with both modern and refurbished vintage materials, and leave a comment here letting us know which are your favorites. 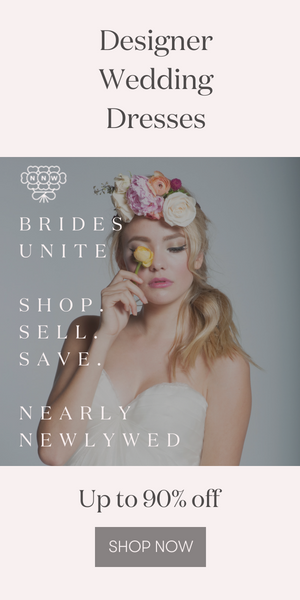 We’ll choose a winner on Wednesday afternoon, and if there are other items you simply can’t live without, Mari is offering all Junebug readers a 10% discount through Feb. 14th – just use the discount code wellwed10 as you check out. Lots of luck everyone! Bel Canto Designs Give Away! I LOVE the “Eliza” Heirloom Pearl Necklace and the rhinestone and pearl chandelier earrings. So beautiful and fun and would go PERFECTLY with my dress! I would also go for teh “Stella by Starlight” vintage bracelet. Beautiful! I absolutely LOVE the “Lily” Vintage Rhinestone and Pearl Headband from the headband section, the featured earrings and the Antique Rhinstone Floral Hair comb. They are truly beautiful! I love the Elise headband and the Ava pave rhinestone drop earrings. Everything is just so beautiful! I love the Deco Buckle Bracelet and Six-Strand Pearl and Rhinestone Bracelet. I am looking for the perfect bracelet for my wedding and these would be amazing!!!! I love the Lily vintage headband! I LOVE the Vintage Crystal Floral Spray Hair Comb! I’ve been looking for a comb and the tear drop shape of the crystals would match perfectly with my dress. I think the Rhinestone and Pearl Chandelier Earrings are absolutely stunning. They look like they would be a perfect fit with vintage 1920’s style wedding gown. When wearing these earrings, a bride’s hair must definitely be swept up into a simple up-do to show off the shimmering gorgeousness of these beauties! I am in LOVE with the Stella by Starlight vintage bracelet! Timeless, classic, elegant and really stunning. What gorgeous jewelry! My wedding has a vintage classic theme and the Stella by Starlight Vintage Rhinestone Bracelet and Simple Pearl Drop Earrings would be perfect with my lace, Jackie-O inspired dress! I will be wearing my hair in a sweeping, romantic up-do to show-off the incredible earrings and the bracelet will be showcased as I walk down the aisle carrying peonies (and for the rest of the evening!). I love all of the treasures at Bel Canto! I’m completely in love with the “Ava” Pave Rhinestone Drop Earrings. How perfect are these for something blue! Simply beautiful! Is jewelry this beautiful even legal? Seriously, I’m curious. The hair combs and earrings are to DIE for. I wonder if the AVA drop earrings can count as my V-day gift to my fiance? I love all of their jewelery pieces, but I especially love the “Giselle” Vintage Rhinestone Earrings. Very elegant! The Zelda vintage hair comb is awesome. So glam! I absolutely love the Sophia Rhinestone Haircomb with the Rhinestone and Pearl Chandelier Earrings. They evoke such a breathtaking, classic elegance. Also – the Art Deco FIligree Earrings are stunning! I am absolutely crazy about the “Ava” Pave Rhinestone drop earrings with the sapphire colored rhinestones. My fiance gave me the perfect deco vintage sapphire engagement ring and those earrings literally compliment it exactly. And the earrings on this page match the vintage headband I am planning on wearing. What a fabulous giveaway!! All of the items in the store are lovely but if I had to pick a favorite it would be the feather and pearl haircomb! It’s so chic and elegant and would be the perfect accessory for my wedding gown! Thank you for hosting this! Cheers! The Sophia and Sapphire Bow combs are both so gorgeous! I’m giving a recital soon (in addition to wedding enthusiast, I’m also a young opera singer) and both would look perfect with the gown I’m wearing! What a thoughtful giveaway. I absolutely love the look and character of all the pieces from Bel Canto Designs. Each piece seems vintage and unique… a look this 33 year old bride knows all about! :) While I personally love the Rhinestone and Pearl Chandalier Earrings for myself, my overall favorite would have to be the “Ava” Pave Rhinestone Drop Earrings. My bridesmaids’ dresses are navy blue and I have been struggling to find jewlery rich and colorful enough to accent their dresses. These are beautiful! Thank you so much for sharing this site! The Ava drop earrings are STUNNING!!! Stunning! I’ll be wearing my grandmother’s wedding pearls for my wedding and have been searching high and low for a pair of earrings that will complement the necklace. The Rhinestone and Pearl Chandelier Earrings are JUST the perfect earrings to go along with my pearls. They are so elegant and fit my style perfectly. I love them. My favorite piece is actually the set of earrings in the give away! I absolutely love the Olivia hair comb. It reminds me so much of my grandmother’s style. Looking through her jewelry when I was a child defined elegance and class for me. Thank you for sharing this site which captures it so perfectly. I love the vintage feel of all of the jewelry. Some of my favorites were the… -“Tres Bella” Headband -Vintage Sapphire Bow Hair Comb -Vintage Rhinestone Bow Necklace -Rhinestone Bow Earrings Heck i could’ve listed everything. I love the Vintage 3″ antique rhinestone hair comb. The Vintage-inspired pave rhinestone and freshwater pearl earrings are also beautiful! The Elise and Lilly headbands would also be perfect for my friend! BEAUTIFUL stuff!! My fave is the “Tres Bella” Headband!! WOW! I’m been searching like crazy for the past couple weeks for the perfect jewelry combining pearls and rhinestones! These chandeliers are perfect but the the AVA sapphires drops would also tie in my sapphire shoes… how to choose? I adore the Deco Buckle Bracelet, any bride would be so lucky to wear this on her wedding day. Thank you for posting! Love all of them, but the “Violetta” Rhinestone Hair Comb gave me goosebumps at the thought of being able to wear something so grand. Nice post! I absolutely have to have the Rhinestone & Pearl Chandelier Earrings, the “Ava” Pave Rhinestone Drop Earrings, and the Three Strand Pearl Necklace!!! Love them! The “Sarah” Vintage Rhinestone Bracelet is beautiful and would coordinate perfectly with the rest of my wedding ensemble. The “Breakfast at Tiffany’s” Tiara Hair Comb would definitely make me feel like a princess on my wedding day! Wow, gorgeous. I love the “Lorelei” Crystal and Pearl Necklace, the Simple Pearl Drop Earrings, the “Stella by Starlight” Vintage Rhinestone Bracelet, and most of all the Rhinestone and Pearl Chandelier Earrings! I LOVE the “Isabella” Rhinestone and Satin Headband. Satin and Creamy White are excellent! I’m loving the Ava earings – what a sweet way to get your something blue! And I might have to buy the art deco filigree ones if I don’t win this contest……. I’m in love with the “Stella by Starlight” Vintage Rhinestone Bracelet! Everything is so beautiful but that bracelet is the perfect piece of jewelry for a wedding… and the names says it all (Stella’s a family name) so it’s so fitting! I love the Antique Rhinestone Floral Hair Comb! I’m going to wear a fairly simple knee-length dress, so this piece would just be the icing on the cake. What gorgeous jewelry Bel Canto makes! The earrings are timeless, perfect for a vintage wedding. I also really like the Lily Headband and the Eliza necklace. Thanks for the link! Ooo me oh my. These vintage goodness are so pretty… Vintage Crystal Floral Spray Hair Comb.. yumo! I love the “Belle Nuit” Antique Rhinestone Hair Comb. This is a vintage item that MUST make a come back! I can see me wearing this in my side-swept hair on the big day. It will certainly compliment my 1930s Hollywood glam inspired satin dress. The vintage feather and pearl head comb. We have a bird motif in our wedding. I want those earrings so badly! Thank you for introducing me to this lovely jewelry! I’ll be picking a piece to go with my wedding dress. For now, I wish I could wear my favorite one, the Breakfast at Tiffany’s Tiara Hair Comb, around town every day with a pair of jeans! I LOVE the rhinestone and pearl chandelier earrings and the “Isabella” rhinestone and satin headband. So pretty! Love the vintage look! I love the simplistic elegance of the “Ava” Pave Rinestone Drop Earrings. I also really like the Art Deco Filigree Earrings. They would look beautiful with one of Claire Pettibone’s Art Deco inspired wedding gowns! The earrings in the giveaway are my favourites. They’re just perfect for adding some vintage glamour to my dress. O, please pick me! “Eliza” Heirloom Pearl Necklace. reminds me of my grandmother. I am obsessed with the Eliza necklace!! And also the earrings featured in the giveaway. simply gorgeous! The Eliza heirloom necklace is stunning, as indeed are the chandelier earrings. Too much pretty, really! I have been searching for the perfect bracelet for my wedding day…and I have found it in the “Sarah” Vintage Rhinestone Bracelet…Swoon!!! I LOVE the “Eliza” Heirloom Pearl Necklace!!! It is *exactly* what I envisioned wearing on my wedding day! In fact, I think I just might have to adorn myself from head to toe with all these pieces — they are fabulous! I couldn’t help myself…I checked out the ‘custom work’ section and lo and behold there was the perfect hair comb! The “Trifari Custom Comb” is a fabulous complement for our autumn themed wedding. I’m doing a happy-feet dance just thinking about wearing it in my hair! I love the Eliza pearl necklace! It’s so perfect! I can’t decide between the “Ava” Pave Rhinestone Drop Earrings, which fit so well into my wedding colors and the “Eliza” Heirloom Pearl Necklace, which is amazing! These earrings are beautiful! I also love the Eliza pearl necklace! I Love the Eliza Heirloom Necklace! It is exactly what I am looking for to go with my wedding dress! The Sarah Bracelet is beautiful! There are so many wonderful pieces! LOVE, LOVE LOVE the Eliza necklace! I absolutely love the Rhinestone and Pearl Chandelier Earrings. I am looking for earrings to wear with my silk, strapless gown. They would compliment my ring very nicely and are really the only other piece of jewelry I plan to wear on my wedding day. Beautiful! Ooooh, I love those earrings! I am also a fan of the Sophia Rhinestone haircomb and the Eliza necklace. Gorgeous! i LOVE the art deco filigree earrings!!! They are exactly the look I was trying to find to coordinate with my dress! Everything else is just gorgeous too!! Wow, the Vintage Baroque Pearl Hair Comb is so gorgeous. The designer is SO TALENTED! I love chandelier earrings and the Rhinestone and Pearl chandelier earrings are absolutely gorgeous!!! I would love to wear them on my wedding day and they will perfectly accent the rhinestones on my dress. Oh gosh! Well I am in love with the three strand pearl necklace, the Eliza pearl necklace, and the Isabella satin and rhinestone headband! I adore the “Sarah” Vintage Rhinestone Bracelet. It is simple, yet stunning; it’s perfect! I am absolutely LOVING the “Rhinestone & Pearl Chandelier Earrings” and the “Isabella” headband. These pieces would be so wonderful with my dress and they are exactly my style! pearl and rhinestone hair comb all the way! so pretty for a nice updo! I would lurve the Isabella Rhinestone and Satin Headband or Vintage Baroque Pearl Hair Comb!! They are so pretty!!! I am completely taken aback by the “Isabella” headband. My wedding is very vintage and this headband would perfectly compliment my soft, sweet dress. The “Sophia” hair comb is also breathtaking. OMG! Everything is soo beautiful & elegant! My favorites are the Sophia Rhinestone Haircomb & the Giselle Vintage Rhinestone Earrings. Both pieces will absolutely complete my wedding look. Thanks for a great giveaway! I love the Eliza heirloom necklace and the Laurel hair comb. Thanks for the giveaway! The “lorelei” necklace and the “sarah” bracelet. Gorgeous! Cant I have em all??? They are all gorgeous! I love the “Abigail” Rhinestone and Pearl Headband and Art Deco Filigree Earrings plus the “Sarah” Vintage Rhinestone Bracelet and the “Eliza” Heirloom Pearl Necklace. These pieces are stunning and took my breathe away. May who whoever shall be lucky enough to be given such beautiful gifts be so greatefull. Thanx for this opportunity. Definitely “Breakfast at Tiffany’s” Tiara Hair Comb. The collection my wedding gown is in was inspired by “My Fair Lady,” so the Audrey vibe fits perfectly! Definitely the ones you highlighted–the Rhinestone and Pearl Chandelier Earrings! So gorgeous!!! The “Eliza” Necklace is my favorite by far. Pearls, rhinestones, and silver are beautiful together. This jewlery is sure to make any bride look dashing. I love the three strand pearl necklace! I love the “Abigail” Rhinestone and Pearl Headband or the “Sophia” Rhinestone Haircomb. Such beautiful pieces! I really love the “Sarah” bracelet. My sister’s friend who is getting married is named Sarah actually!! The Stella by Starlight vintage bracelet is my favorite! I’ve been searching and searching for the right bracelet for my wedding day. Beautiful!!!!!!! ****Great style! My favorite earrings are the pearl /rhinestone pair. I love how dramatic they are and would look AMAZING with an updo.. They would compliment my ivory lace trumpet gown very nice ;) The custom for Molly earrings are gorgeous as well. My favorite bracelet is the “Sarah” vintage rhinestone. The “Lily” headband is charming. The Deco Buckle Bracelet is just to die for. Actually, all of the bracelets are just stunning. I love the Empress necklace and earring set. Beautiful! I love the pearl and rhinestone earrings! totally cherish the Rhinestone and Pearl Chandelier Earrings. I am searching for hoops to wear with my silk, strapless outfit. thanks for sharing..